I am a huge fan of sunglasses and I would love to wear them anytime and anywhere. They can make a simple outfit look so chic (actually any outfit looks chic with sunglasses). I also love having different styles of sunglasses. Each style helps create the vibe of the outfit. Wearing an aviator creates a casual, cool vibe or wearing large, oval shaped shades creates a Jackie O vibe. If I had all the money in the world, I would totally buy every style & brand. Unfortunately, that is not the case. In most cases, the best sunglasses are very expensive! Luckily, there’s Ditto. Ditto is a company that allows us sunglass lovers to wear unlimited designer sunglasses (or prescription glasses) at a super affordable monthly subscription fee. Each time you are ready to wear a new pair, you just swap it out for the next eyewear of your choice! Yes, you heard it right. You can wear those Karen Walker Super Duper sunnies, Ray-Ban Aviators, or Illesteva mirrored shades for $24!! You can thank me later 🙂 Or even better, how about getting your first month free by using this promo code ‘RDSOBSESSIONS‘. I know, it is crazy, but so good and awesome! I’ve been eyeing the Prada 0 PR 09 QS for a long time. But it costs $385 and we all know that is super pricey. Thanks to Ditto, I can now wear it for $24. I wear it for a month long or switch it out after a weekend and get a new pair within that month. I love this company’s concept and hope you guys do too. Seriously, try it out for free first (just use the code RDSOBSESSIONS) and let me know your thoughts! Such a great look, Rachel! Love the scarf and your hair looks so cute! Isn't Ditto the best?! Thanks Rachel! It is seriously the best! Loving this look on you!!! I am in love with those jeans and those boots! You look so fantastic and so chic! 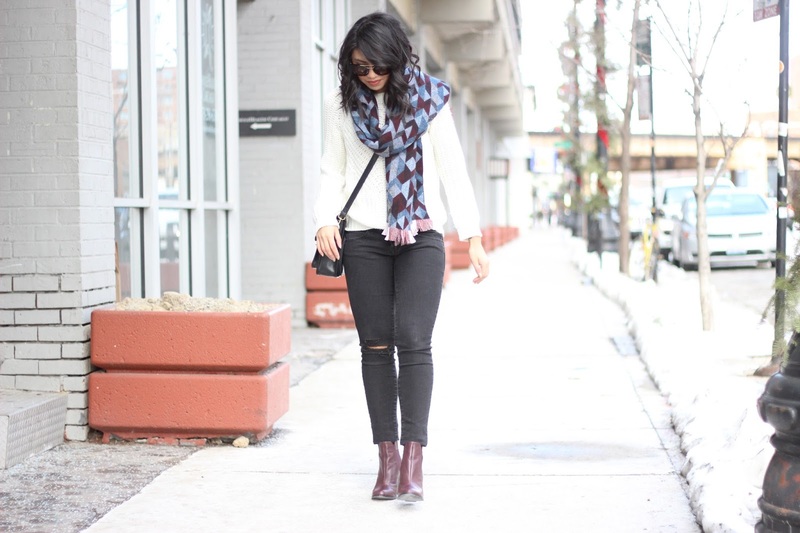 Love that geometric scarf and how your booties are the perfect compliment! Have a wonderful day! Isn't Ditto the best?! I love swapping out my sunnies all the time. These look great on you, and I am loving your look. It seriously is! Such an awesome concept! I LOVE DITTO! It's amazing. I think it's such a fun program – because honestly, I only really need two nice pairs of sunglasses, but it sure is fun to switch out and wear different kinds! Love these sunglasses on you! So true!! Which is why I love them too! OMG love that scarf!! So pretty!! Love this!! The colors go together so well! You look beautiful! I really like the scarf! Love that bag and those boots! Hope all is well! Thanks Ariel! Hope you are doing well also! wow what a great idea!! Thanks for sharing rachel! Loving those shades, Rach! So hot, and those ripped denim look so hot on you! Aw thank you so much Vanessa! I love this look! Those jeans and sweater make a great combo! These sunglasses look amazing on you! I tried this shape and it just was not flattering on me, but it looks so fab on you! Aw thanks so much Heidi! I had the pink version of these Prada sunnies — big hit. Loving your layers (in your clothes and your hair). I love the pink one too! I'm considering getting that one next! Thanks Mischelle! My sister gave the scarf to me for Christmas! I'm one of those who usually waits for some cheap knock off to mimic the overall "look" of designer sunnies. (; I'll have to look into this! yes yes! love the scarf and boot combo! the colors are perfect together! LOVEEE THIS LOOK!! LOVE MY DITTO TOO! So cute! Those sunglasses are adorable. 🙂 I also love your scarf! 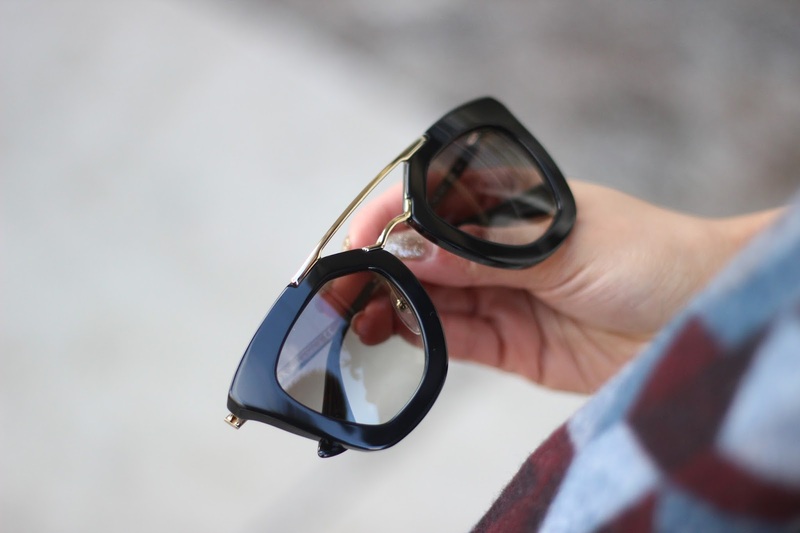 I love that you went with these edgy, chic sunnies — they make your more casual outfit really stand out! This is such a beautiful outfit, and I love the sunglasses…they are gorgeous! Love, love this look on you, Rach! The jeans look amazing on you and you're killing me with all your gorgeous scarves. And your Prada sunnies top everything off very nicely. Nice outfit babe, very comfy! Thanks Carmen! Haha yea I am not surprised! My sister got it for me for Christmas! You look great! Love your scarf!! You look super cute in that outfit. Thanks Barbrah! Thanks for stopping by! I LOVE those glasses and the boots! the whole outfit is adorable! Thanks Angelie! They're from Prada! I love this look! And the quality of these photos are really good! Ehat camera do you use? Thanks Jordie! I use a Canon Rebel T3i! Loving this whole outfit! That sweater and scarf are adorable! Thanks Mary Kate! Thanks for stopping by! Absolutely beautiful!! That scarf is perfect! Your hair is so so pretty! Thanks Sydney! Thanks for stopping by! I really like this outfit, it's definitely something I would wear myself as well. Love those boots too! Thank you for sharing with us. You can get more…..